Facebook Live is a live video streaming service introduced recently to promote video content in Facebook News Feed. It’s part of an aggressive strategy to let the users create and broadcast live video content on Facebook without any hassles. With Facebook Live, all you need to broadcast a live video is a device with a camera and Internet connectivity. 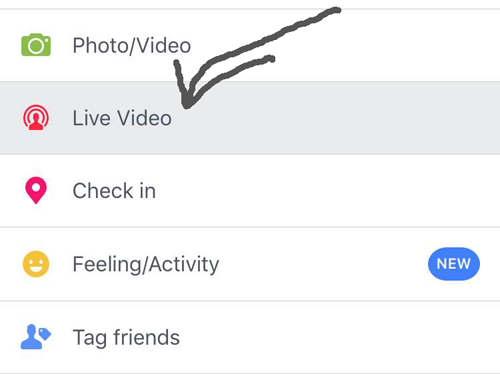 While live streaming services have been around for well over a decade, Facebook Live has now made it a real breeze to organize an event and share its live feed to the intended audience. There is no doubt that videos can be an excellent tool for capturing viewers' attention and delivering your messages in a precise manner. The prospect of using the power of live video to spread brand awareness in a meaningful way is too difficult to resist. The following guide will help you to get started, analyze your progress and improve the quality of your Live campaigns. 1. Log in to your Facebook account and open up the status bar as you would normally do to post. 2. A list of options would appear below the text area. Can you see an icon of a rounded human silhouette on the bottom right corner of the options bar? That's the Facebook Live button. 3. Click on that icon to configure the settings. First, you will be prompted to give Facebook access to your camera and microphone. Grant the access permission and click on the 'Continue' button. 4. Up next, you will be prompted to choose your privacy settings. You can choose to broadcast the event to everyone on Facebook (public), only to your friends or just to yourself. You can even selectively add people from your contact list or block specific individuals from accessing your live stream. Based on your privacy settings, Facebook will send notifications and invites to the intended recipients. Live videos posted on behalf of Pages will be public. 5. Now you are all set to launch your live video. Write a compelling description about your live broadcast. This will show up on the visitors' News Feed as a status update above the video. So be precise and clear, but there's no harm to put up an attention-grabbing headline to attract more viewers. 6. The final thing before you go live is to set up the camera view. Make sure that the camera is pointing in the right direction and covering the desired areas. 8. 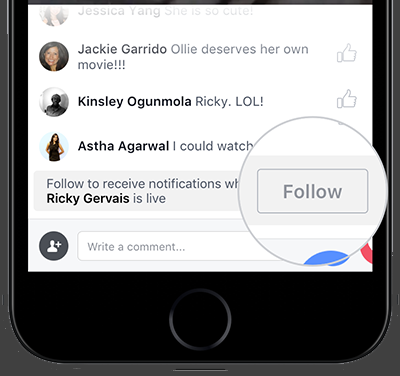 Facebook Live offers you the ability to interact with your viewers in real-time. During your broadcast, you will see the number of viewers and their comments, which you can choose to respond to. You can interact by speaking directly with them, or by responding to comments posted on the bottom of your feed. That's an awesome way to keep your readers engaged. 9. Once you are done with your broadcast, click on the 'Finish' button on top of your screen to conclude the live session. 10. Finally, do make sure to save the video on your camera roll. By doing so, you will have a copy of the original broadcast, which you can repurpose at a later time. It is impossible to measure the performance of a marketing campaign in the absence of accurate statistics. Launching your first live video campaign on a platform as massive as Facebook is great, but how do you know whether it was a success or a failure? 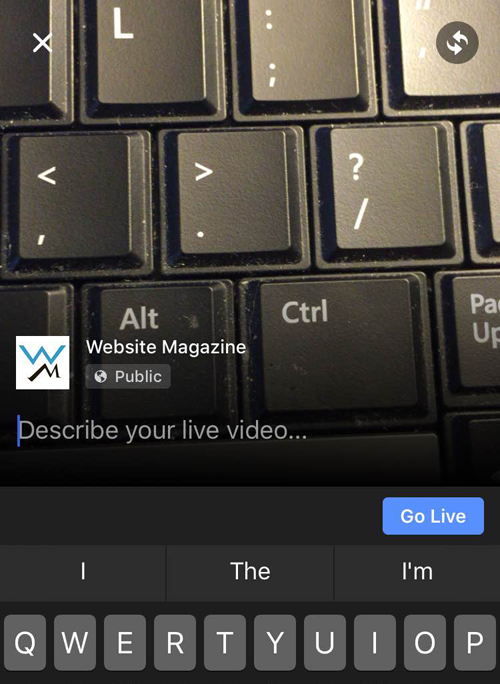 Thankfully, Facebook Live offers detailed statistics to derive analytical insights on the performance of live videos. It has been designed to help marketers learn more about their target audiences. Minutes Viewed - Total watch time (in minutes) spent on the video by all the viewers. That's inclusive of both 'Live' views and the views generated after the conclusion of the event. Video Views - Total number of cumulative views (non-unique) generated on the video. Multiple views by the same viewer are counted separately. People Reached - Total number of people to have seen the notification about the live event in their News Feed. Unique Viewers - Total number of unique visitors to have watched the video. Peak Live Viewers - Details of viewer count while the video was broadcast live. Average % Completion - Average percentage of visitors who have watched the complete video. Number of Reactions/Comments/Shares - Count of viewer actions in the form of reactions, comments and shares. If you have created a Facebook page to promote your business, then you can access the video statistics from within that page. Step 1: Login to Facebook and go to your business Page. Step 2: Are you able to see the navigation menu on top of the page content? Click on the four menu item labeled as 'Insights'. Step 3: A secondary menu will now be visible on the left-sided pane. Click on 'Videos' to go to the video repository. Step 4: Now scroll down toward the bottom of the page. You will find a link to 'Video Library'. Click on that link to get the list of all of your videos published till date. Live videos, that were published through Facebook Live, will have a human silhouette icon to distinguish from the general videos. Step 5: Click on the corresponding video for which you would like to access the statistics. A new window will open up with the detailed analytics for different metrics as listed above. Step 6: It is possible to drill down further by clicking on a particular parameter to view the graphical representation in chronological order. For example, if you click on 'Video Views', you can see an interactive graph with the number of views generated on a day-to-day basis. Wondering how to get the most out of your Facebook Live campaign? Don't worry, we are going to conclude the article with five essential tips to succeed with your next Facebook Live broadcast. A catchy headline can help your video go viral. So before going live, make sure to post a compelling headline to capture viewers' attention. Don't afraid to be creative, but ensure that you are not going off the track. Accompany the headline with a precise description of the event to set the expectations right. Success of any marketing campaign depends on its ability to reach the intended audience. Facebook Live is no different. It’s important to let your audience know about your upcoming live broadcast. Target your personal network, the followers of your business Page and the members of relevant groups. News Feed posts can help build up a decent number of viewers. If you have the right kind of budget, then you might consider promotion through paid Facebook ads as well. Don't restrict your promotion within Facebook alone. There is a world outside Facebook as well. So inform your blog readers, send emails to your subscribers and invite your friends from other networks to stay tuned to your upcoming live video. The more people you can reach, the better it is for the success of your Facebook Live video. Make your broadcast an interactive session to drive better viewer engagement. People love to be heard, especially during an event that is being recorded or broadcast live. So invite questions and comments. Make sure to interact with your viewers and respond to their comments during the live event. It would be even better if you can get personal. Respond to your viewers' comments by mentioning their names and encourage them to stay engaged with follow-ups. It would make your audience thrilled, for sure. Visual appearance does matter when you are broadcasting a business event. So put a little effort to get the aesthetics right. Dress like a professional marketer, pay attention to the background views and ensure that the sound system (microphone or headset) is properly tuned. After all you are here to convince your audience, so make every possible effort to look and sound convincing. As is the case with all marketing content, make sure to call people into action toward the concluding section of your video. Irrespective of whether you are asking people to follow your page, claim a reward, purchase your products/services or try out a free trial, you should tell them, show them how to follow up. For instance, Facebook recommends brands call out that their audience can tap on the "Follow" button on live videos and videos that were live and then opt-in to get notifications the next time the brand goes live. Video streaming through Facebook Live is an incredibly powerful opportunity for Internet marketers to turn viewers into customers. Considering Facebook's massive global reach, it's definitely worth investing your time and energy to broadcast your marketing videos through Facebook Live. Olivia Young is an independent online marketing consultant for Internet Choice, a resource site that lets you find all Internet service providers in your area with an easy search-by-zip feature. You can follow Olivia on Google Plus.